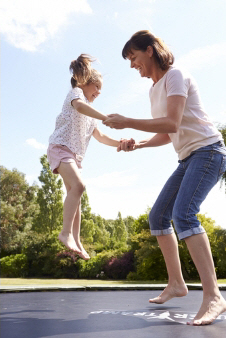 As a parent, there's a lot you can do to raise healthy and active children. We are our children's greatest role models. Your children will generally do what you do, and what you do will become their normal behaviour. Here are some ideas of what you can do to be a great role model. Think about what you are eating. Is it what you want your children to eat? Think about how much you are eating and how you are eating. If you find you are eating on the go a lot, look at how you can relax when eating and enjoy your food more. Eat breakfast. It's an important meal that your children should see you enjoying too. Be active. This is great for you, and great for your children. See Keeping active for information about how you and your children can get active or keep being active. Sit down to eat at a table for at least one meal a day. 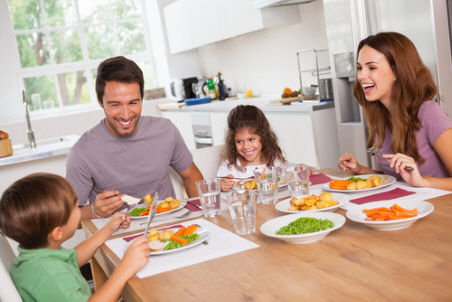 Breakfast and dinner times are great times to be a healthy role model for your children. There are several things you can do to teach children to eat well. Fussy eaters can be frustrating for parents. It's tempting to focus on negative things such as a child refusing to eat the food you've prepared for them. It's important that it doesn't become a power struggle. See Fussy eaters for information about how to cope with this. If they get frustrated or upset, you could say something like, "I can see you're upset about not liking the carrots, but thanks for trying them. I appreciate that." Take your time eating your food. This is how children decide what they like. We don't all like the same food. Mealtimes can often be focused on the rules rather than on enjoying the food and the time together. For example, some parents insist that children eat all the food on their plate. It's more important that they try the food. Take the attention off the food and onto creating real memories for your children. Often we have rituals around food that we remember from our own childhoods and these are important. You're creating the same for your children. During meal times ask them what are three great things that happened to them during the day. Let everyone take a turn. Children enjoy these conversations at the dinner table. Praise your children for trying new things, making healthy choices or enjoying their food. When our children are little, it's important that they explore their food. This can be messy, but very meaningful for them and their relationship with food. As children get older, help them to keep exploring food. You can do this by including them in preparing meals, planning meals, getting lunch boxes ready, making shopping lists, picking fruit or vegetables from the garden, and supermarket shopping. If children associate positive memories with sweet food, they'll want more. There are many other ways to reward children. If you have the time and energy, a small vegetable garden is great to create with children. They learn about food preparation and the science of food. See the links below for ideas. Just as we teach our children about their relationship with food, we also teach them about their relationship with physical activity. Here are some ideas to teach them to be active. Be positive about physical activity. Enjoy sport and praise people who play it. Encourage active play. Kick a ball around, go for bike or scooter rides, or run around with your children. You can also jump on the trampoline or take them to the park. It's good for them, and also good for you. Encourage and support your child to play sport (when they are old enough). Practise with them and watch them play. These are great ways to build your child's childhood memories. Also see Ideas for keeping kids active. Your child may behave in ways you find difficult to manage. See the Parenting section for information about child behaviour and what community support, including parenting programmes, is available. Many of these programmes are free. You can also talk to your GP or practice nurse. They will give you advice or refer you to a parenting programme. Spend time with your children. As well as the ideas above, you can do things like play a game or read to them. Spending time with your children is really important to them, no matter what their age. Children can be bullied over what they have in their lunch box. Take note if your child tells you they are being bullied, or you suspect they are. You can find some resources that can help in Bullying (for children and their parents). Suggestions for parents and caregivers to encourage children to be more active and make healthy food choices. Tips and resources to help you connect with your whānau and culture. Suggestions for planting a vegetable garden and other fun activities in the garden. Written by Family Adviser, All Right? Wellbeing Campaign. Adapted by HealthInfo clinical advisers. Page created October 2016.